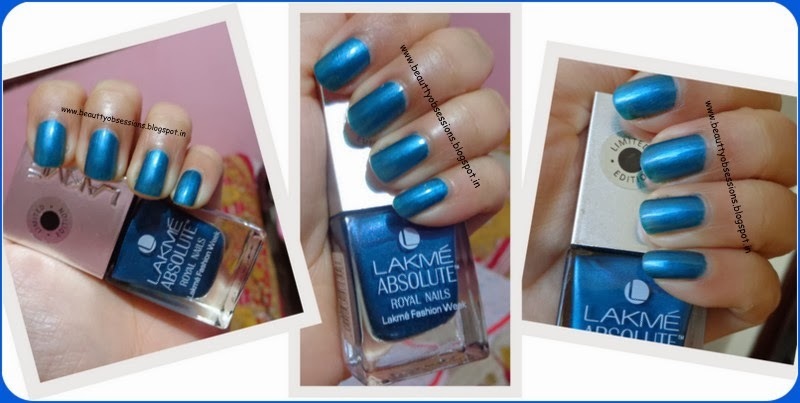 Sort Review & NOTDs ~ Lakme Absolute Royal Nails " Teal Fantasy"
Here is another shade nail paint of Lakme Absolute Royal Nails range (you can check the first one here) and the shade name is "Teal Fantasy". It is a very pretty Metallic Teal shade which have very fine simmers. It looks very very shiny on nails and beautiful too. Packaging is classy and strudy enough. The rectangular silver cap is very unique.. It costs Rs200/- for 10ml. The apllicater is wide which covers the full nail in two moves. In spite that the texture is thin, two swipes effectively give full coverage. It dries up quickly on nails. It doesn't cheap for 3-4 days easily. Here is the upzz and downzz of this nail polish..
1- It is from their limited edition range... may not be available now.. Final words: Very pretty shade..Looks good on nails... I love it..
Have you tried Lakme Absolute Royal Nails in shade Teal Fantasy...? Do share your experience..